Two weeks ago, I posted a Geek Chic Update: Jewelry and Accessories Edition, where I showed you earrings made out of computer parts, YOUtility Belts, and a necklace featuring Han Solo in Carbonite. Who knew Han's frozen suffering would be so fashionable? Whatever Tim Burton movie is out. Whatever Johnny Depp movie is out. And everything else is Gir from Invader Zim. Really? That's what you have to offer me? Guess I'm heading to the web. A good friend of mine, Kaitlin Stewart (not to be confused with Kristen Stewart or she'll stab you), is the brains and beauty behind the geek fashion blog, PwnLove.com. The site has been featured on Kotaku a number of times for always posting the coolest geek fashion before anyone else discovers it. Today, she's here alongside me to throw in her suggestions. I'll admit these picks are mostly for the ladies, but some are suitable for all gamers, coming in both men's and women's sizes. Kaitlin, start us off! Have you been saving your bottle caps? Enjoy a refreshing bottle of Nuka-Cola, the most popular soft drink before and after a nuclear war. I took an Introduction to Marketing class in college and I can verify that you just can't beat branding like that. Now, do as Vault Boy says and drink up! Sanshee's shop is packed with geek culture inspired t-shirts, posters, pins, stickers and accessories. Ken Levine even wore their Bioshock inspired t-shirt on stage at E3. One of their most popular items includes Metal Pokémon Gym Badges, a must-have for any aspiring Pokémon Master. When I first saw this hoodie online, I had my doubts. From the pictures, it looked a bit too "Admiral Ackbar-ish" for my taste. However, my long-time friend Stuart sent me one in the mail and I immediately fell in love with it. It looks very cool in real life and is quite comfortable. With the hood down, it appears to be a normal sweatshirt; with the hood up, it's instant cosplay! Holy, Red Shells, Mario! Any Mario Kart fan can appreciate a tee that honors the classic Nintendo racing series. While the Blue Shell is the most meddlesome, a true Mario Kart fan will tell you that the Red Shells are the best item to have in your inventory. The maker of the popular Assassin's Creed hoodie, Insert Coin Clothing, sells video games t-shirts and hoodies. Their newest range includes Sega and Devil May Cry collection. The clothing store recently announced their entrance into the accessory market with Sega classic console bags. Want to dress like geek icon, Felicia Day? Well, Ashley Mertz and her shop, Go Chase Rabbits, has the skirt just for you. She makes vintage circle skirts patterned with your favorite geek culture references. These fun and flirty skirts range from Doctor Who to Star Wars to classic Nintendo games to even vintage controllers. There is a skirt for every type of geek. I've recently slipped back into my old ways of being a Pokémon addict, losing sleep each night while playing Leaf Green because IT'S THE BEST POKEMON OF THEM ALL. …You know, in my humble opinion. This shirt is perfect for both the Ash's and Misty's of the world, and is available in Charmander, Bulbasaur, and Squirtle. Gotta wear ‘em all! The guys at Cherry Sauce Clothing have been friends of mine for a few years, sending me all sorts of shirts and hoodies to wear to video game expos. As soon as they caught wind of my questionable fashion sense and hatred of shopping, they pretty much emailed me and said, "Don't worry. We'll take it from here." Being a horse person, the Old West would be a dream come true for me. I'd love for my main mode of transportation to be on horseback. I loved Red Dead Redemption because it let me live my cowboy fantasy of riding around the frontier without rules. If you're a cowboy at heart like me, then grab your biggest belt buckle and this Redemption t-shirt. Who doesn't love the cute rodent who can electrify you without notice? If you're ideal Pokémon companion is filled with high voltage or he is your main in Super Smash Bros, grab this Volt tee to honor the electrifying Pikachu. From the heart of a true gamer and professional apparel designer who has been named the "Godfather of Gaming Tees." 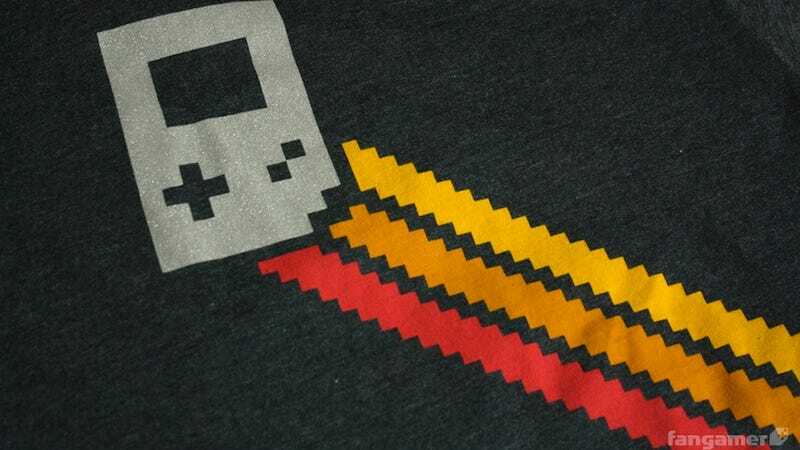 The humble but talented mastermind of Bitmap'd, Gerard Flannory, weaves subtle references to our favorite games into each of his t-shirt designs. The small shop consists of 9 designs with plans to introduce more this year. His most popular t-shirt is 7Kingdoms, inspired by Mario 3 and available in P1 (red) and P2 (green). Warp Pipe Mugs. Earthbound messenger bags. Chrono Tigger keychains, Starfox tees… Fangamer has it all. You're sure to find an item that will immediately drum up nostalgia, since their inventory is packed with SNES-older era games, aka the games of our youth. Ask Lisa, I'm a bit Zelda-obsessed and I discovered Fangamer after I found an incredibly badass, Triforce t-shirt by Cory Schmitz in their inventory. Fangamer not only offers quality designed t-shirts but really puts more into their packaging than any other video game clothing company, ensuring each order comes with a myriad of stickers, pins, and even a personal note called a "packy slip." When Kaitlin Stewart isn't giving dating advice or talking about Zelda, she is probably writing about Legend of Zelda on her video game fashion and merchandise blog, Pwn Love. She'd be the holder of the Triforce of Wisdom and would be a Ravenclaw. She currently works as a Social Media Manager.